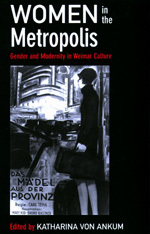 Bringing together the work of scholars in many disciplines, Women in the Metropolis provides a comprehensive introduction to women's experience of modernism and urbanization in Weimar Germany. It shows women as active participants in artistic, social, and political movements and documents the wide range of their responses to the multifaceted urban culture of Berlin in the 1920s and 1930s. Examining a variety of media ranging from scientific writings to literature and the visual arts, the authors trace gendered discourses as they developed to make sense of and regulate emerging new images of femininity. Besides treating classic films such as Metropolis and Berlin: Symphony of a Great City, the articles discuss other forms of mass culture, including the fashion industry and the revue performances of Josephine Baker. Their emphasis on women's critical involvement in the construction of their own modernity illustrates the significance of the Weimar cultural experience and its relevance to contemporary gender, German, film, and cultural studies. Katharina von Ankum is Assistant Professor of Germanic Languages and Literatures at the University of Cinncinati. She has taught at Cornell University and the Claremont Colleges.